Droids, transformers, cylons, the Terminator. Whatever you want to call them, human-like robots have long been integrated into our cultural imagination. Thanks to recent advancements in engineering, they may soon become integrated into the real world as well. Leading the way for robotics is a company called Boston Dynamics, originally part of MIT, which specializes in creating robots that move like humans and animals. Most of their models are designed to traverse rough terrain. One can climb walls while another can jump 30 feet in the air. “We pride ourselves in building machines that are both innovative and actually work,” Boston Dynamics’ website claims. Boston Dynamics has recently made headlines with its latest creation, a humanoid robot called Atlas (amidst an embarrassing number of Atlas Shrugged jokes). According to io9.com, a prototype of Atlas has been around for about a year; the current version was unveiled this past July. 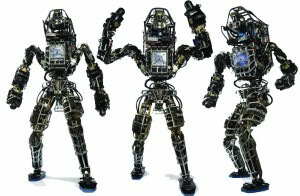 The bipedal robot features three-fingered hands, a laser range finder and 28 hydraulic joints. Atlas can walk unassisted across uneven terrain, a task that may seem easy to us but has long stymied robot designers. Seven teams of programmers and engineers from universities and private organizations are currently working on expanding Atlas’ repertoire ahead of a contest in December. Yet for all the progress made, Atlas is far from self-sufficient. As reported in The New York Times, the robot requires a tether attached to a harness to supply it with power and to protect it from falling over should it misstep. Atlas’ movements are often jerky and slow, a far cry from the coordinated robots of science fiction. Boston Dynamics has other life-like robots closer to completion. The company has developed several automated pack animals, designed to carry equipment over rough terrain, that are currently in the process of being field tested. Boston Dynamics’ website has photos and videos of these machines romping through forests and along beaches while carrying loads of up to 400 pounds. Their Cheetah model, whose four-legged running style mirrors its namesake, currently holds the record for fastest legged robot at an enviable 29.3 mph. It operates on a treadmill, albeit with a remote power source similar to Atlas’. On Oct. 3, Boston Dynamics posted a YouTube video of Cheetah’s ‘untethered’ version, WildCat, galloping around a parking lot. According to io9.com, WildCat can currently only reach 16 mph, but its designers hope to raise its speed up to 50 mph. Boston Dynamics gets most of its funding from the Defense Advanced Research Projects Agency, a branch of the Department of Defense that seeks to “maintain the technological superiority of the U.S. military,” according to the agency’s website. Despite their martial backers, all parties involved hold that they are developing these robots to save lives, especially after natural or man-made disasters when it would be too hazardous to send in human first responders. For instance, its designers hope that Atlas could be deployed following earthquakes or in compromised nuclear facilities. However, how soon any such life-saving could occur is uncertain. According to The Hong Kong Standard, during a public demonstration in Hong Kong on Oct. 18, an Atlas robot broke its ankle while trying to point at a nearby object. Despite the impressive advancements made, it looks like it will be a while before I get my T-100.